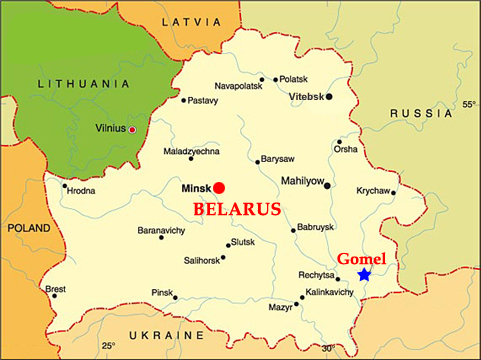 Gomel lies in the southeast of Belarus on the borders of Russia and Ukraine. It is located on the right bank of the beautiful river Sozh. Gomel is considered the second large commercial, industrial and manufacturing city and is also the cultural and sporting center for much of the region. It is also one of the biggest educational centers in Belarus having 7 institutions of higher learning, 11 specialized technical schools, 13 professional schools and 75 secondary schools in the city. Gomel region experiences mild climate. Average temperature in winter is -5OC, and in summer it reaches upto 40oC. Gomel - one of the oldest cities in Belarus, founded in 1142. Now it is the second largest city in Belarus with a developed industry, infrastructure and a population of about 600,000 people. The city is located in the south-east of the country on the banks of the river Sozh and borders with Russia and Ukraine. Due to its geographical location Gomel - an economic, cultural, scientific and educational center, it has 7 higher educational institutions, a lot of entertainment clubs and centers. The city is famous for its tourist attractions, among them - the Rumyantsev- Paskevich Palace, built in the late 18th century, a drama theater, the Cathedral of St.. Peter and Paul, and others. Gomel state Medical University is located in Gomel, the second largest city in Belarus. Gomel is located in the south-eastern corner of the country. Gomel is the main city in the region, which is divided into 4 districts. The Gomel region also boasts numerous lakes and extensive canal systems. The Gomel region has an extensive rail network; there are airports at Gomel and Mozyr.